A few years ago I had an epiphany. I was either watching or reading something about Alex Webb, an extremely talented street photographer, and heard him talk about the amount of time he sometimes waits for the right shot. Up until this point, 95% of my time was spent walking up and down streets looking for serendipity to strike like an 85-year-old woman sitting at the slot machine pulling the lever time, after time, after time, after time, waiting for her lucky moment. You see, Alex talked of his seemingly endless patience and the time he spent in the same spot waiting for elements to line up the way he wanted them to. Finding a scene with great composition and waiting for your subject(s) to interact with it. This could be any number of compositional elements like great light, natural framing, interesting architecture, etc., or a combination of many/any of these. If you’re an avid street photographer then you’re probably aware of the guilt you feel when you stand in one place for too long. I don’t have a scientific term for it but it is a real thing, when we stand idle for too long we feel as if something amazing is probably happening on the next street over… So we must move on or risk missing this God-given moment. The realization that maybe I should be waiting for the stars to align turned this fear upside down on me. It kind of felt like damned if you do and damned if you don’t. Finally, with the help of Webb, I realized that I was missing so many amazing opportunities because of my impatience. I would come across areas where composition was perfect but their were no subjects. It was like all the lights were on but there was nobody home… Simply working that area (spending some time there), like I would a beautiful landscape scene, started to yield some really positive results. My rate of capturing what I felt were good street photographs increased considerably. All the images above were taken in the same area. I will return to this spot from time to time because, compositionally speaking, it’s got the makings of a great shot. It’s a good idea to make a note of the best areas to trap, just like a hunter would do if he or she were trapping beavers or whatever it is people trap these days. I like to return to areas like this at different times of the day/year to work the light directions and qualities. 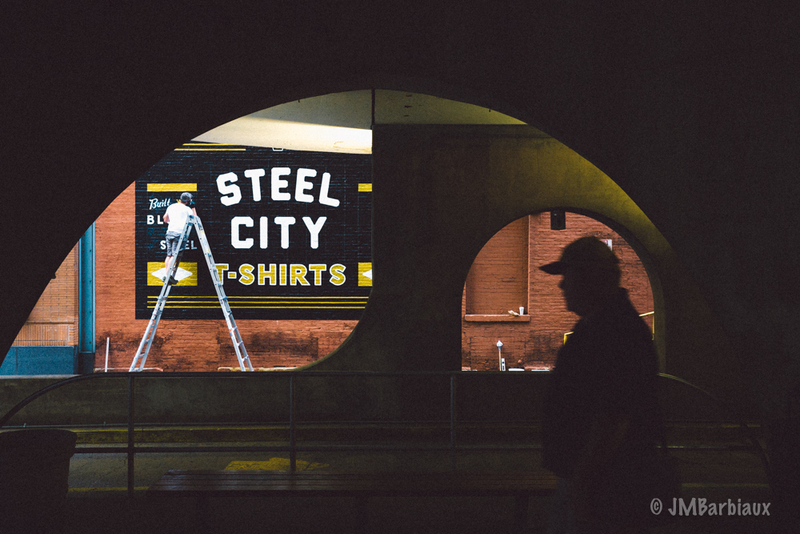 There are many areas around Pittsburgh where I’ve taken street photos that I’ve never published because the area is perfect but the subjects were boring… I’ll return to these spots weekly or monthly to work them, all the while learning the best times of the day and how to best compose the scene. An area where I’ve spent some time trapping but have not found what I’m looking for. I will return to this area from time to time until I find the perfect (to me) shot. The key to successfully implementing trapping is to strike a balance between following your curiosity and setting “traps”. I’m certainly not proposing you spend all of your time standing in one spot when visiting a new city. My approach, when traveling, is to let my curiosity lead me in the afternoon when the light is not as ideal (though I do like hard light for color street photography) and mark in my mind, or on my phones map, the areas I want to return to and trap at whatever part of the day I feel the light will be best. In addition, it really helps to know the path of the sun in relation to where you are so you can visualize your end result when looking at potential areas. Apps like The Photographer’s Ephemeris work well to help you visualize the path of the sun before hitting the streets. Interestingly, I now feel like street photography is its own paradox. You must be quick. You must slow down. You must let your curiosity lead you. You mustn’t move on too quickly. All great advice, all seemingly contradictory. Make room in your brain for these contradictions because they are all true. 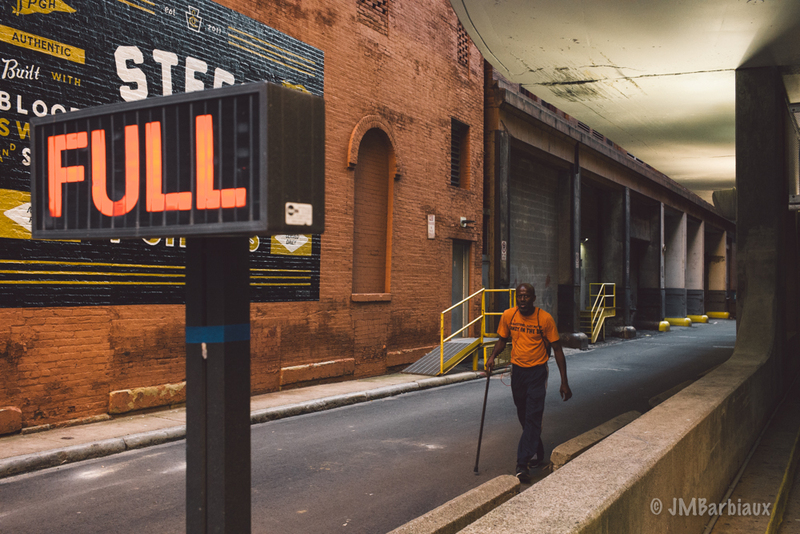 Street photography, and life, is all about balance. Everyone’s balance will be a little different but there must be balance. Trapping can absolutely improve your “hit rate” when it comes to capturing great street photographs. In fact, the simple act of looking for areas to trap will help you visualize your images and spot potential scenes more efficiently. But in order to find these potential spots you must let your curiosity lead you. When that alarm goes off in your head, the one that tells you that you’ve just found the perfect scene, you must trust yourself and commit to working it until you get what you want or have spent some time there (I usually like to give myself 45 minutes and then move on). This is called balance. What do you think? 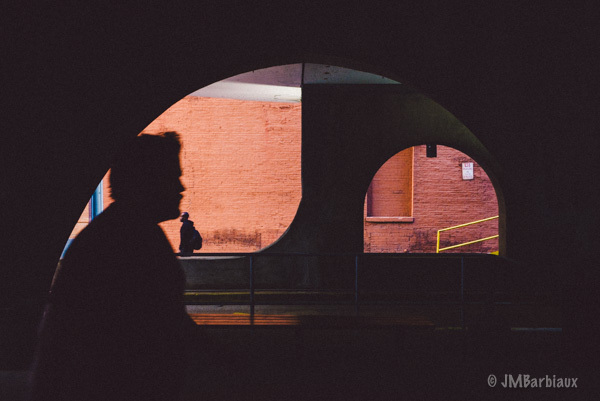 Have you spent much time “trapping” while practicing street photography? Feel free to leave your thoughts in the comments section below. Great article. Makes good sense. I do have a question about the photo with the gentleman walking with the cane looking right at the camera. When you took the shot and brought the camera down, did you make eye contact with him or do you just act as though you were not even aware of his presence? 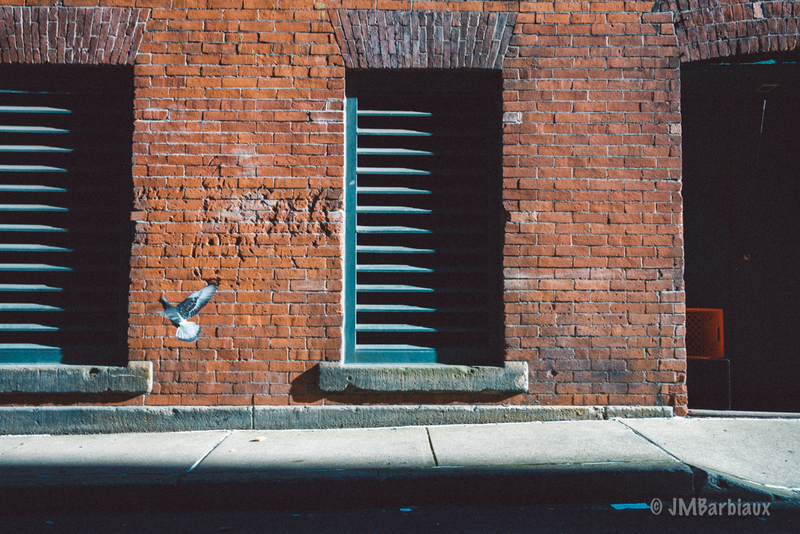 Also, I love the photo with the pigeon, red crate and blue shutters! As always, nice work. Yes, I made eye contact with him. Sometimes I’ll act like I didn’t notice them or even irritated they “walked into my shot” but this guy seemed nice and we simply exchanged pleasantries as he walked past after I took his photo. I’m sure he knew what I was doing but I figured if he said anything I’d respond with “hey man, you walked through my shot”. The best part about trapping is you’re usually already set up with your camera so it’s not like you’re picking it up right as someone walks past, giving away the fact you’re about to steal their soul with your camera. I have the same question Becky! I’ve found when I jump into street photographer mode, I find it awkward when someone sees me shooting them, or a crowd. How do the pros handle that? Great question! I can’t speak for everyone but I handle it a few different ways. First, I find it helpful to remind myself that I will probably never see my subject again… I realized this helps when I was photographing in NYC and found that I was much braver than when in my hometown. After some introspection I realized that the anonymity was the cause. When shooting professional street photography it certainly helps that you know you need to justify the fee you are charging and you don’t want to let your client down… You are motivated to push through the slight (or massive) amount of anxiety you may feel. Finally, I have found it helpful to remind myself that life is short, moments are fleeting, and often we only get one chance to capture something truly magnificent. Everyone is different and we all handle the anxieties of our job differently. I hope that helps. There really isn’t a silver bullet answer here, you kind of have to embrace the awkward feeling and own it like a boss. Know it’s going to happen but the outcome is worth the temporary discomfort. Thanks for reading, take care.